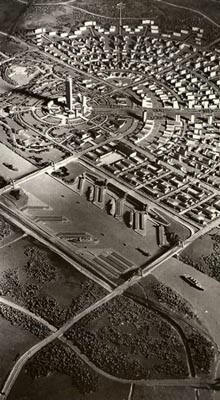 In the New York World’s Fair of 1939, a hugely popular exhibit was Democracity: a gigantic diorama of a utopian society set in 2039. From twin rotating balconies, the visitors looked down on what was supposed to be “a perfectly integrated garden city of tomorrow” and surrounding countryside as seen from seven thousand feet up. The city was a carefully planned community built on the shores of a river with the streets radiating out from a central tower–a perfect giant urban sundial setup, (although this may not have been what they had in mind).